Everyone seeks purpose and relevance in life, and everyone has a code; boundaries they won’t cross to attain those things. Drrr! is largely about what happens when the interests and the methods of a great number of people clash, which is almost always immensely entertaining, especially when some of those people can carry sportbikes on their shoulders. 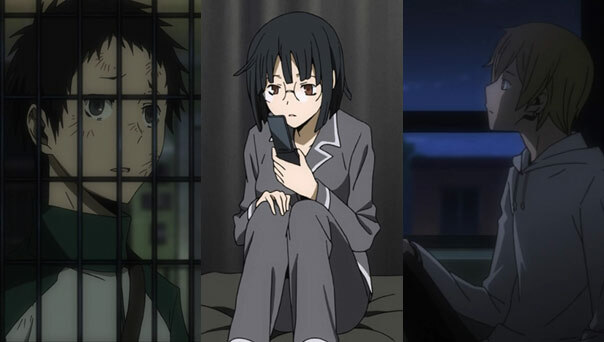 The book on Chapter one of three of Drrr!x2 comes to a close with “Adversity Makes a Man Wise.” Shizuo is the force that ceases the brawl between the Rogue Dollars and Saitama, as well as Anri and Varona. Non’s kidnapper is punished, and both sides are satisfied and withdraw. Also, Walker opens his eyes. 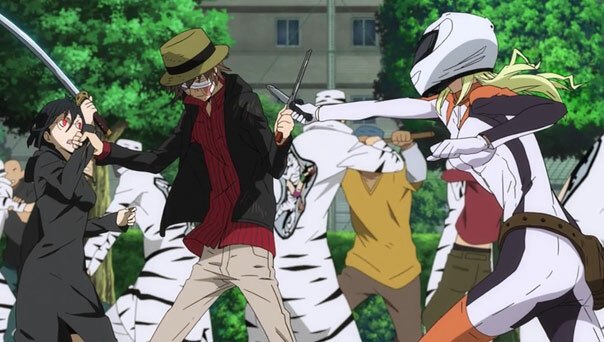 I would too if I saw Anri handling Saika. But that’s far from the end of the adversity. Mikado watched firsthand (while his vision wasn’t wreck from that flash grenade, that is) what the gang he founded has become. He doesn’t like it, and wants to do something about it; no more hanging back. 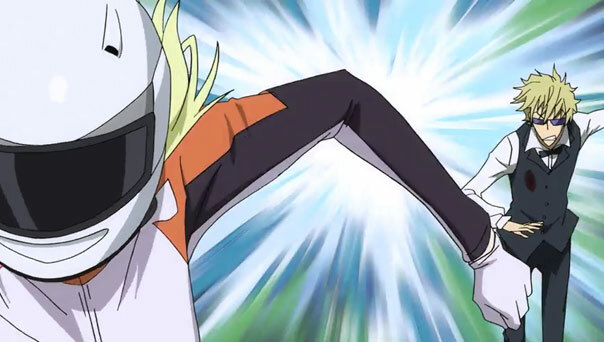 But first, Varona meets the unstoppable, nigh invincible Shizuo, who unlike Celty or Anri, is a full-blown human being, which both astounds and frightens her, because nothing she throws at him seems to work, nor can she get away with Sloan and Akane. 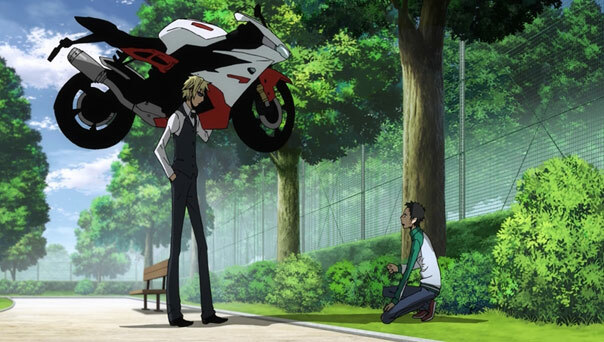 Shizuo sets his mind to rescuing Akane, so after some car soccer, instant automatic weapon disintegration (IAWD), and box truck punching, he succeeds. Akane is confounded he’d save his would-be assassin, but he’s just glad she wasn’t hurt, and a new, unlikely friendship is forged, with a helmet-scratching Celty as witness. This was Varona’s first defeat this week, but by no means her last. Mikado, meanwhile, tracks down Chitage and Non to formally take responsibility as founder of the Dollars. Chitage doesn’t think he’s lying, but isn’t entirely impressed either, and believes the few moments of time he has to look over Mikado is sufficient to conclude Mikado has no business running the Dollars, and advises him to give it up at his earliest convenience and settle into “the ordinary life” he seems better suited to. 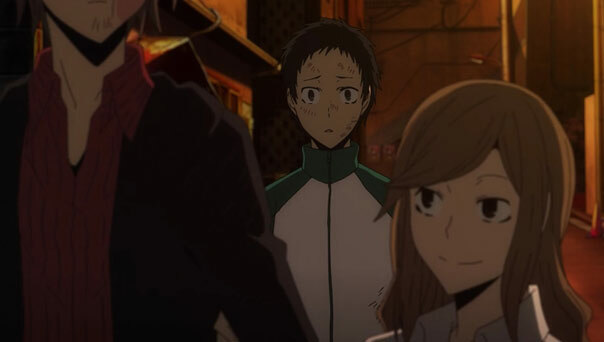 Little does he know that ordinary life is the very thing Mikado escaped his hometown and founded the Dollars to avoid. If he were to quit on them now, it would “negate his being.” He may be better suited for ordinary life, but he doesn’t want to live that way. He wants to be in the thick of it. Mikado isn’t the only one patronized and not taken entirely seriously. 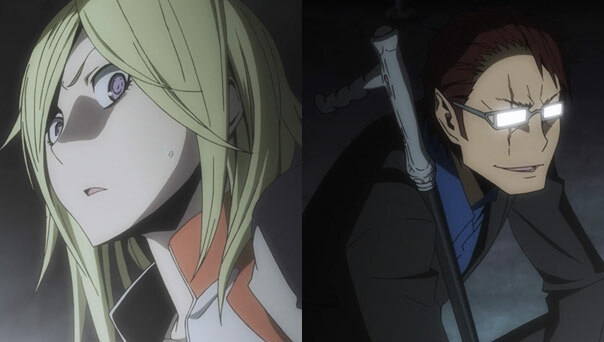 Varona is too, after her quiet meal with Sloan is suddenly interrupted by Aozaki and Akabayashi. 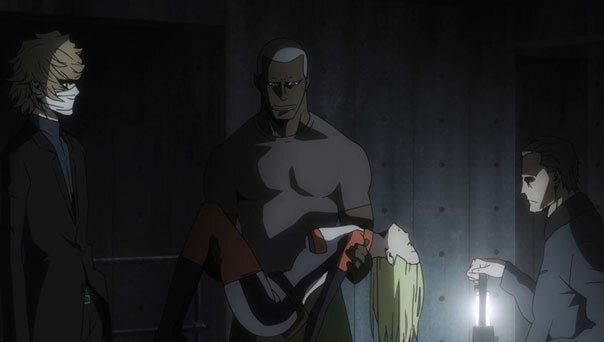 Like her, I thought she was tougher than these guys due to her military training, but they bring her and Sloan down with grim efficiency, only to reveal that Varona’s dad has struck a deal with their organization to secure her safety and retrieve her. Dennis, Simon, and Egor arrive to pick her up, and point out that, after all, she’s “still a little girl” who hasn’t “hardened” yet, remarking that kids liker her can still “change in all kinds of ways.” She may have become an assassin at a very young age, but she’s not necessarily destined to be one forevermore. And the yakuza ambush really put her skills into perspective; up to that point, she’d depended heavily on firepower, stealth, and surprise. 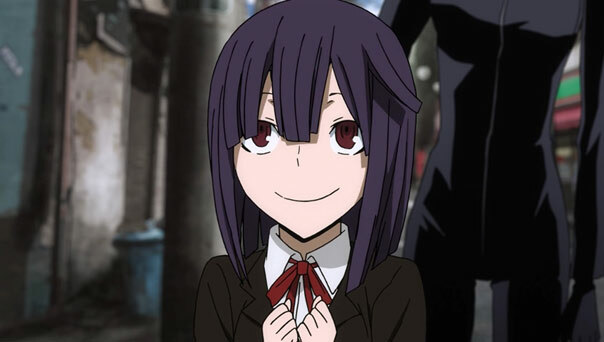 Not to mention her youthful exuberance over Ikebukuro dulled her senses. Speaking of hardening, that’s what Mikado aims to do, and furthermore, what he has to do to preserve the Dollars as he envisioned them. All the adversity he’s faced really has made him wise to the truth of his situation: to be able to take control of a group with no rules, he needs power, so he accepts Aoba’s offer to become the leader of Blue Square along with the Dollars, even forming a blood contract by uncharacteristically stabbing Aoba through the hand with a pen. 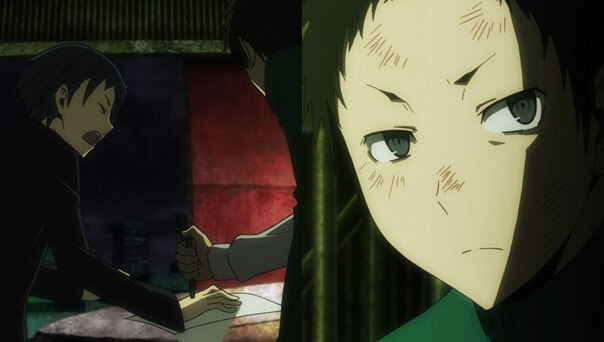 Then again, Mikado is pissed Anri was put in harm’s way, so he’s mad. But once that contract is signed, he snaps back to his usual chipper self, even offering to dress the wound he just gave Aoba. In a way, he owes Aoba one for opening his eyes to the fact that he shouldn’t fear being left behind by all the strange and exciting things in the city, because he hasn’t caught up to it yet. His journey is incomplete, and this was never a static situation. He’s going to fix the Dollars and stay in the mix. 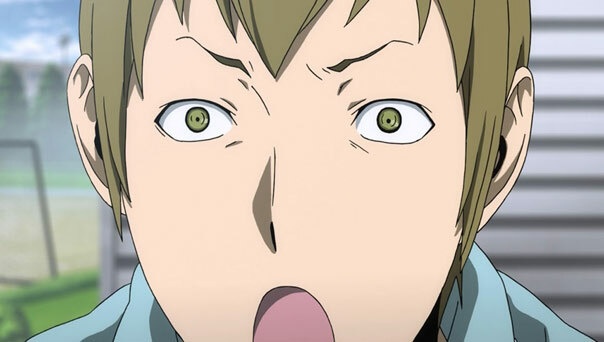 We close with one more person being one-upped at his own game, as Varona was: Izaya, who had been slipperier than teflon throughout the show. Like Mikado, even he didn’t realize the full scope of his actions, and ended up stepping on the toes of one Yodogiri Jinnai, who didn’t want Shizuo and the Azuki group getting mixed up. 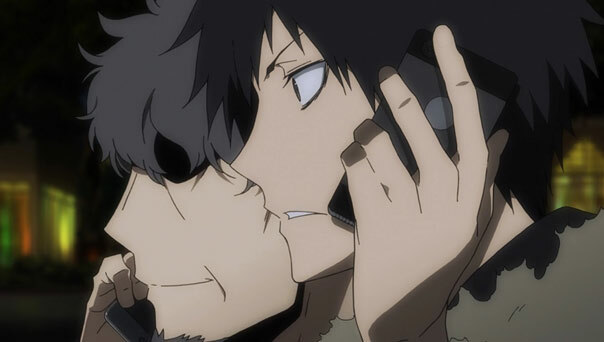 For that, Jinnai literally takes Izaya out, leaving him lying in a pool of blood in a crosswalk. A provocative and enticing teaser for Chapter 2, to air in July.